ATI’s Remote Wonder II is a large, slender remote, measuring 8.94” long, 2.23” wide and 1.25” thick (22.8cm by 5.7cm by 3.2cm) around the mouse cursor pad/joystick. 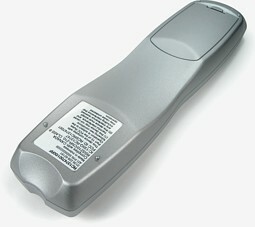 The remote is quite svelte compared to the previous model – most of it is only 1.12” (2.8cm) thin. For its size it’s also light, weighing 5.2 ounces (145 grams) with the 3 bundled AAA batteries, or just 4.3 ounces (121 grams) without. The balancing point is exactly at the midpoint, a bit more forward than is usual, but as many frequently used controls have been positioned nearer the front, this should work out for the best. Exactly 50 buttons grace the front of the remote, plus the mouse cursor pad, an upgrade from the 44 keys on the first Remote Wonder. Starting at the very top is a rather jumbled collection of device, power and mouse keys. Down the left side of this grouping are four large, transparent mode keys marked [AUX1] through [AUX4] that illuminate when that mode is active. A fifth identical button marked [PC] is positioned to the right of [AUX3]. The space below [PC] is occupied by a shiny [ATI] button, while above [PC] are two small non-transparent buttons labelled [DVD] and [TV]. Continuing above those are two colored buttons with generic [A] and [B] labels. Along the right side from the top are [Power], [Help], [Maximize] and [Drag] keys. Finally, below all of this, are two three-quarter-moon-shaped [Left] and [Right] mouse click keys near the outer edges. Those two mouse keys are within reach of the Remote Wonder II’s special rounded cursor pad – which looks something like a colossal IBM TrackPoint for your thumb. There’s quite a bit of empty space around the pad, so ATI seems to be placing much importance on the remote’s cursor capabilities. We’ll see just how well it works a bit later. Below the mouse pad are [Volume] and [Channel] toggles arranged on a 45 degree angle, with a [Mute] key between. This diagonal placement may not be as customary as a vertical layout, but is more ideal than the first Remote Wonder’s horizontal arrangement. Further down is a 10-digit numeric keypad, which also has letter labels printed on the case, much like a telephone keypad. Below that is a standard 5-way cursor key grouping, bordered on the bottom by four additional colorful multipurpose keys labelled [C] through [F]. At the very bottom of the remote is an unusual arrangement of 6 transport control keys. Other buttons in the bottom half of the remote include [Menu], [Setup], [Info] and [TV-On-Demand]. 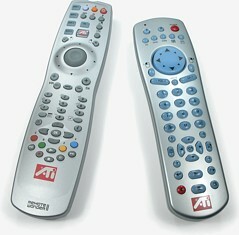 Ergonomically the Remote Wonder II’s case is plain but comfortable. The outer sides and bottom taper inwards slightly near the mouse pad, making it the natural place to grip. From this position your thumb is within easy reach of the mouse pad, volume and channel buttons. Slide your hand upwards to change devices, or down for the keypad, menu and transport controls. Some lateral twisting of the plastic case is possible, but not much considering the size and lightness of the remote. Both halves of the case are finished in matte metallic silver paint. The smooth rubber keypad is predominantly grey with black printing, but some touches of color spice it up: the six customizable keys are each a different color – light blue, orange, red, green, yellow and blue; the five “device” keys are translucent; the [Power] button is red, while the [ATI] button is clear plastic with ATI’s logo in red and white. The [ATI] button even lights up as it’s pressed... but chances are your finger will block that effect!